This year we have been “Taking the Round Robin into the 21st Century” as a challenge at our work. In February each staff member had to bring a 6 inch starter block in a designated colour from the colour wheel. This week we took possession of ‘our’ block and now we have to feature Aurifil threads on it to make it into a mini quilt with quilting and/or embellishments. Back in February, I had to work with the colour Violet and make a 6 inch block. 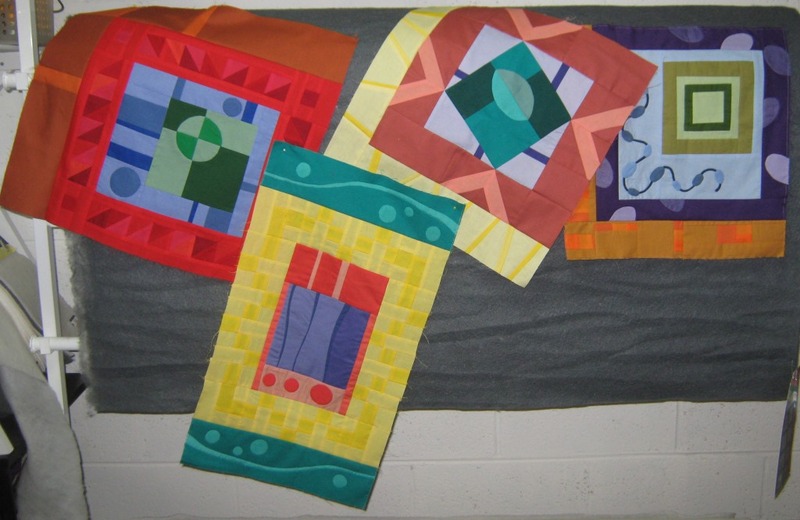 Then every two months we were to add borders of different sizes to each relevant quilt block. 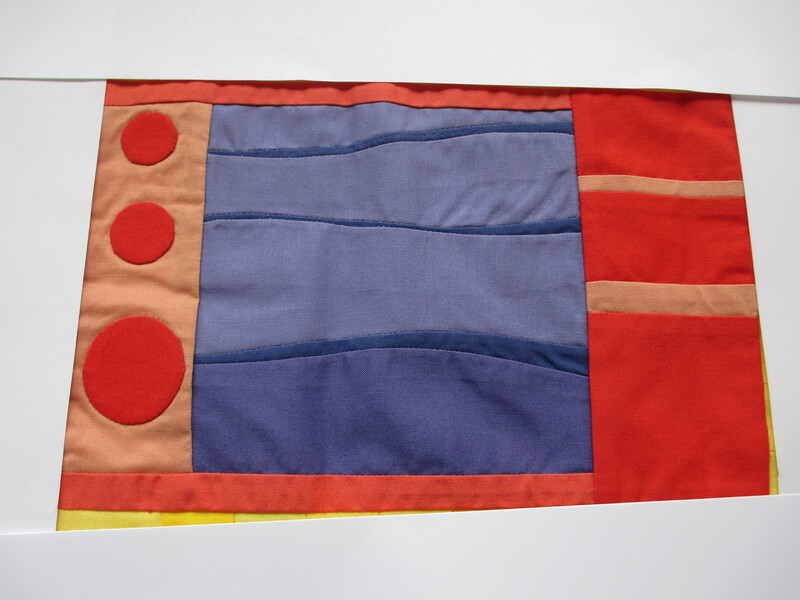 Round two of mine was made by Judy using a red-orange colour to create an asymmetrical border on four sides. 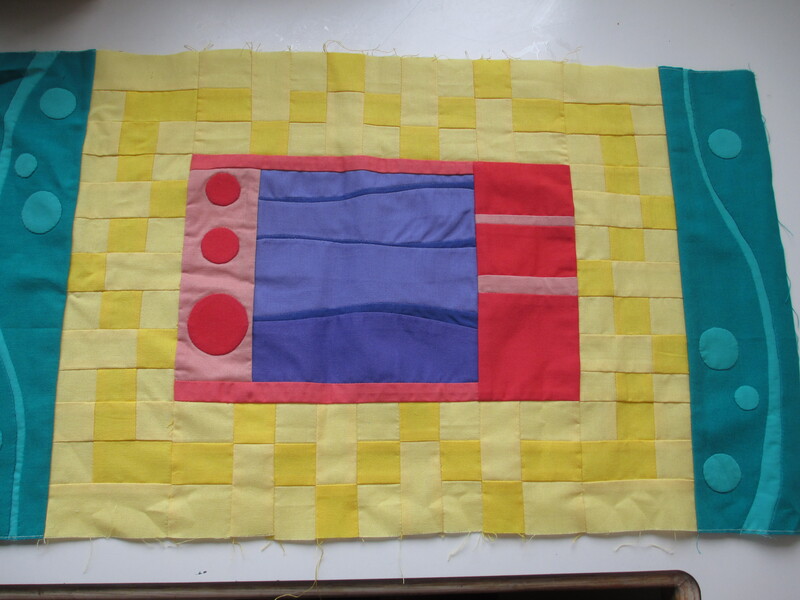 Then Yellow was choice of colour for Jenny, with an even size border on four sides ( no more than 3 inch wide) added. 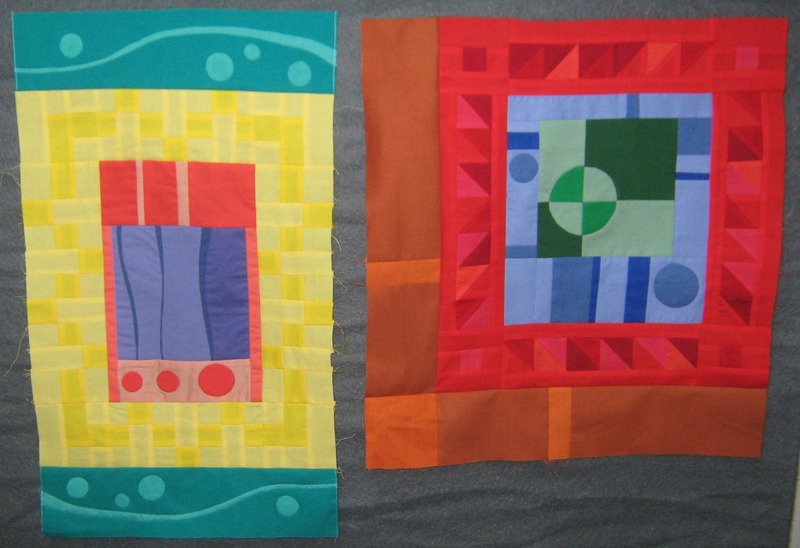 Here are all the quilts (hung over some of the batting in the shop) showing the results. 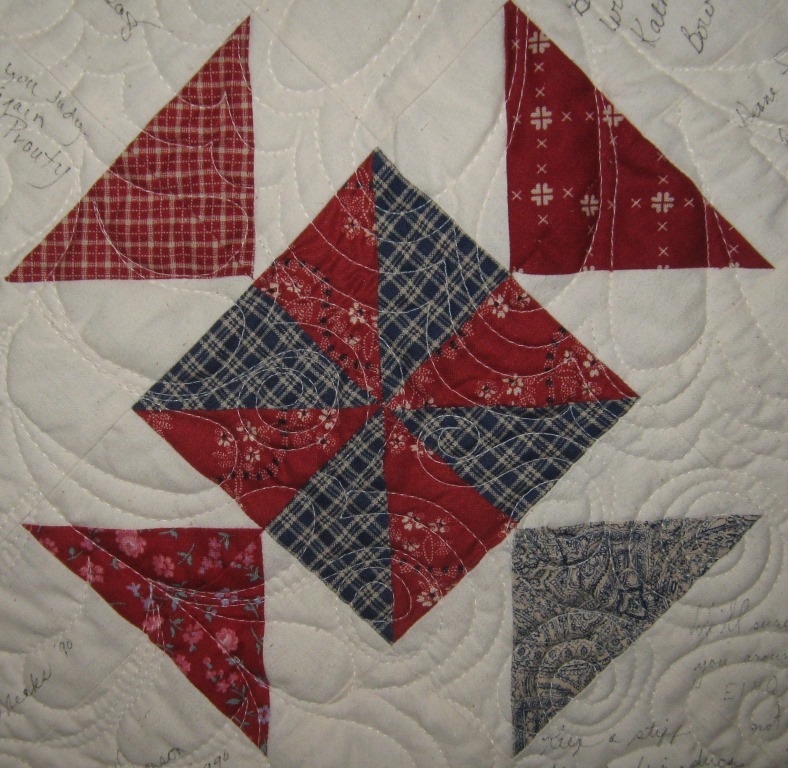 It will be fascinating to see what everyone chooses to do with their individual quilts. 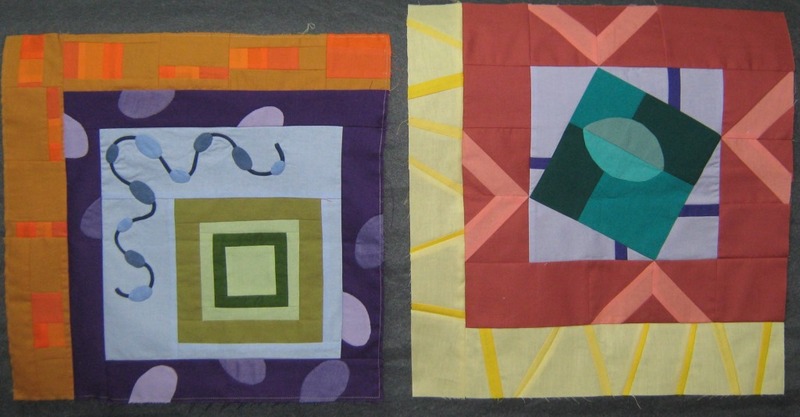 We have been given some time to finish the quilts as they will be displayed at the Melbourne Wholesale Quilt Market in November – and if we are really keen and finish them before hand, someone may even blog about them earlier!! 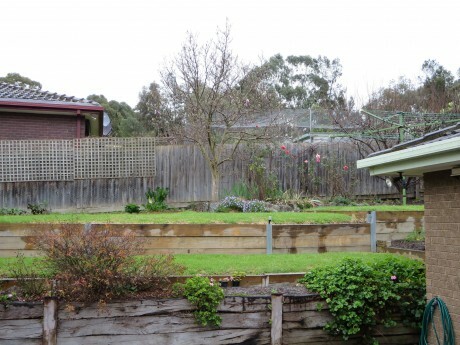 Here in Melbourne we are in the grip of winter, where the weather specialises in dull, dismal, damp and often draughty days. A typical wintery day in my back yard. It’s the perfect time of year to indulge in some handcraft of the woolly sort! 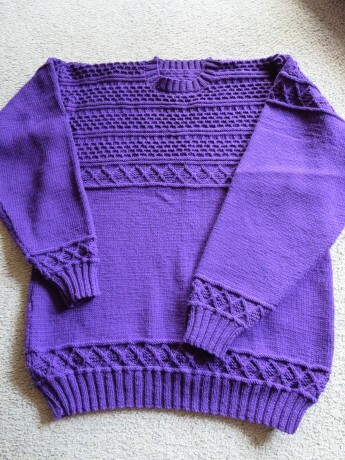 8 ply jumper which is actually a darker purple than it appears here. 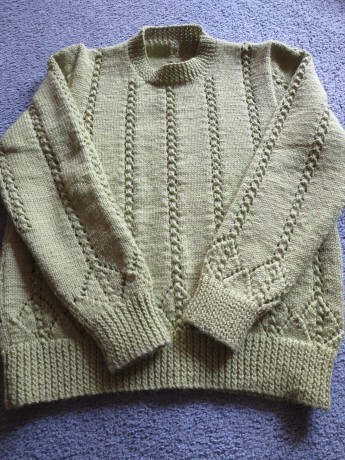 …and a jumper for me. This is much greener than it appears! 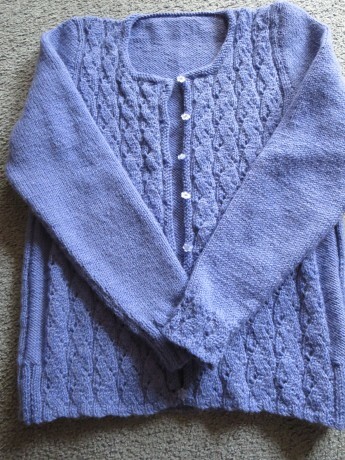 I have also just completed a cardigan for myself. When sewing on the buttons, I always use cotton thread, not the wool in which the garment is made, as this is too thick for this purpose. 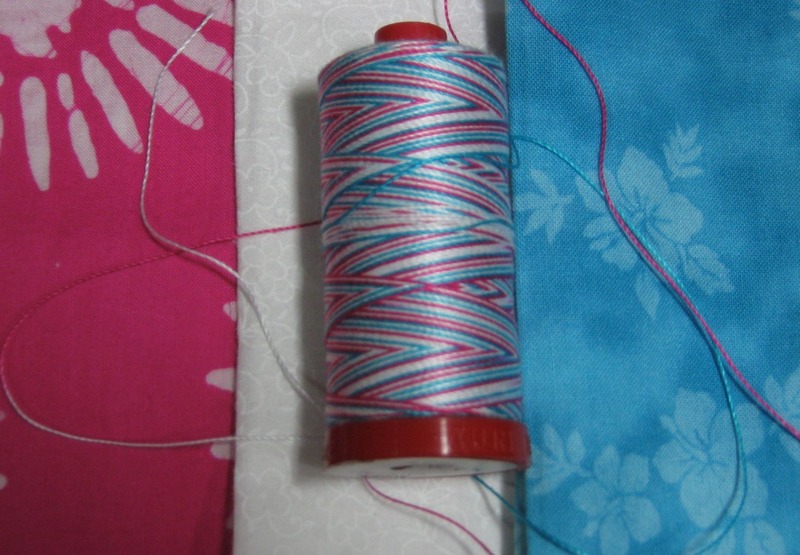 With 270 colours in the current Aurifil Cotton Mako range, I can find one that’s just right. 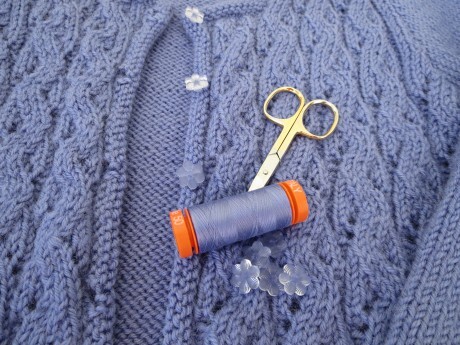 Sewing on the buttons with Aurifil thread. I always have a number of different knitting projects on the go (just like my sewing!!!). One of the things I am currently working on is a jacket for a friend. 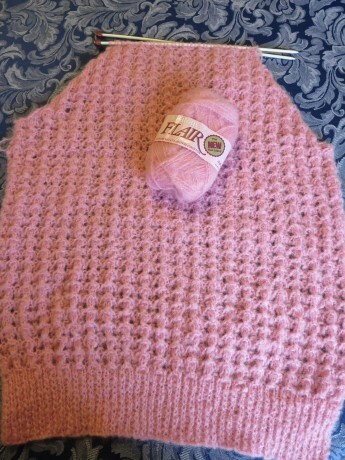 When her mum died a few years ago, she inherited some yarn which she asked me to make up for her. It must be 70s-80s yarn, a wool, mohair and nylon mix, and although the band says 7 ply, I am knitting it to an 8 ply pattern. 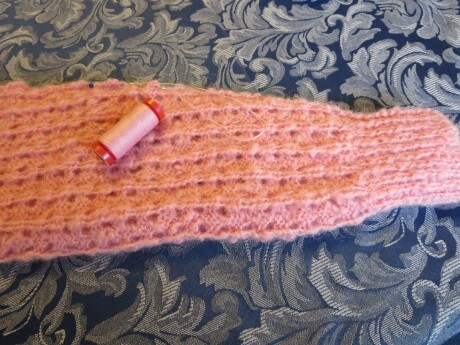 I had to do a bit of research and “trial and error knitting” to get the size right. Because this yarn is so fluffy and uneven in texture, it would be a nightmare to use for sewing the garment together, so I will use Aurifil Lana (50% Australian wool/50% acrylic blend) to sew it up. The Lana slips through the seams effortlessly. Sewing up a sleeve with Lana. 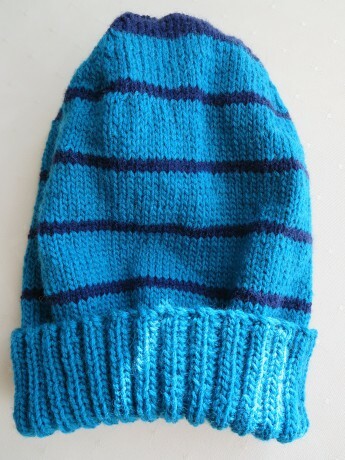 Another current project is a beanie for my husband to use on the boat (the last beanie went west on a previous fishing excursion). There was a bit of trial and error involved with this item too, as I had a request to make it a bit bigger than the pattern, so that it wouldn’t sit too tightly on the head. 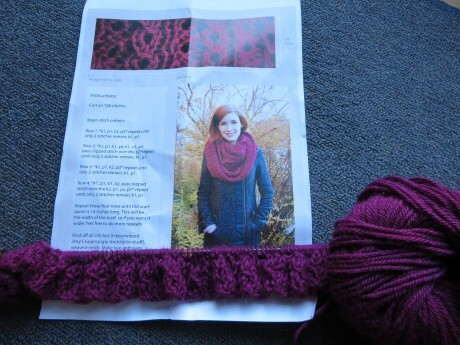 A friend showed me her current project, a scarf using some fabulously soft Alpaca yarn in a rich mulberry shade. Just beautiful! 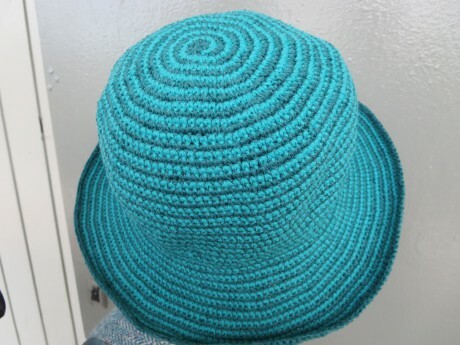 Another friend showed me her hat, made from knitting 2 strands of carpet wool together. In addition to my knitted woolly projects, I am also preparing for a couple of items using wool felt. I’ve selected Cotton Mako 28 for use with this. The other project will be a small 15 inch wallhanging using these materials. This time I will use Lana (wool blend) thread. So while the temperature outside may be in low figures, the sun may be hidden and the wind whistling, I’m snug indoors surrounded by my wonderful woolly things!! Many colours in our lives have special significance. Some colours reflect age old traditions and some reflect new and exciting trends. 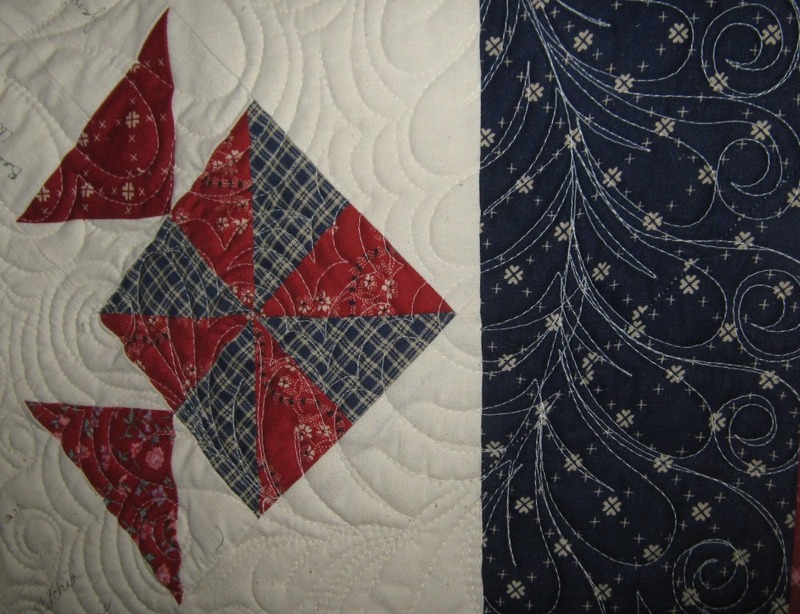 I am the proud owner of a red, white and blue quilt. 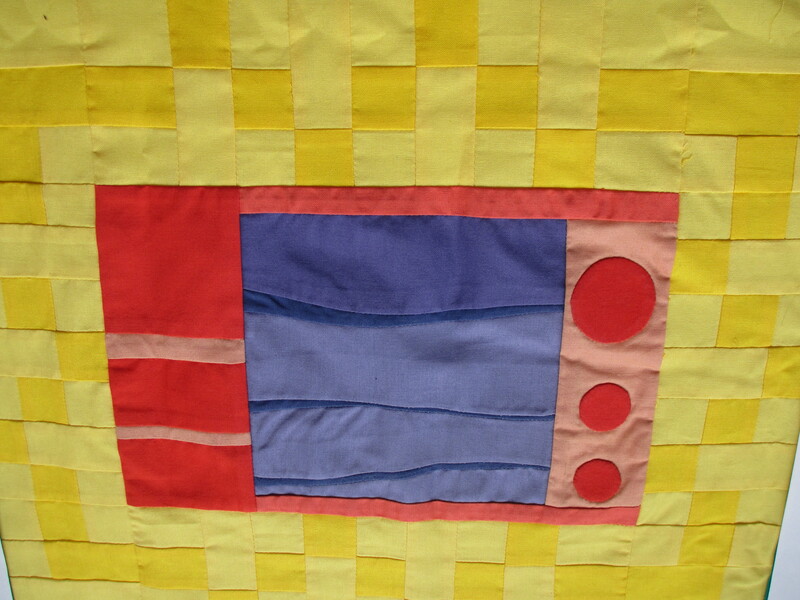 When I moved away from the Midwest in America, my quilting friends made this delightful quilt. It came with plenty of room for signatures and thoughtful phrases. 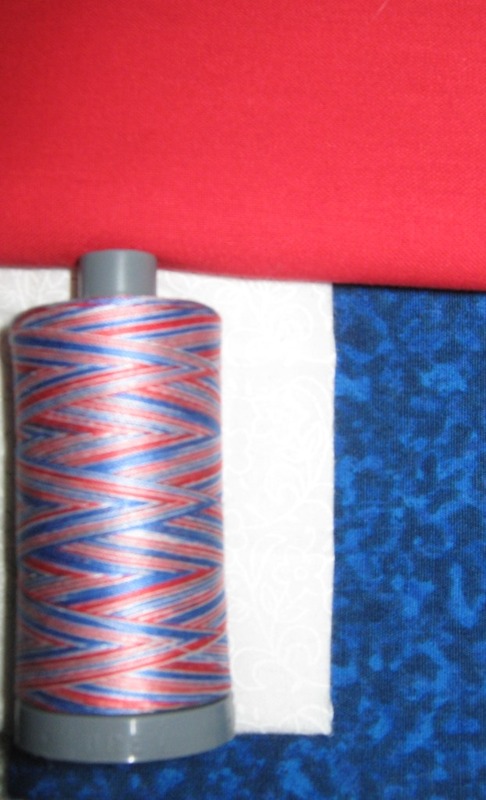 Today when I consider making a quilt with red, white and blue fabrics, Aurifil’s variegated threads spring immediately to mind as they give me several choices. For a more modern look, I match the colours in the Mako Cotton Colour #4647. 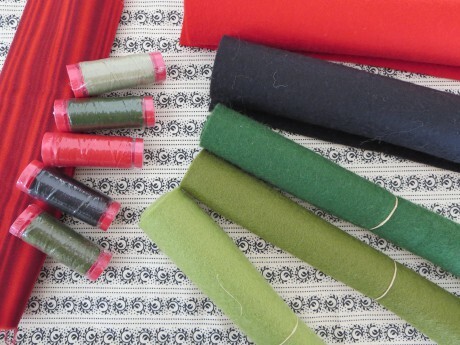 The next time you want to remember a place or an event with a quilt, try matching your Aurifil thread colour to a Holiday themed quilt or a country’s flag. 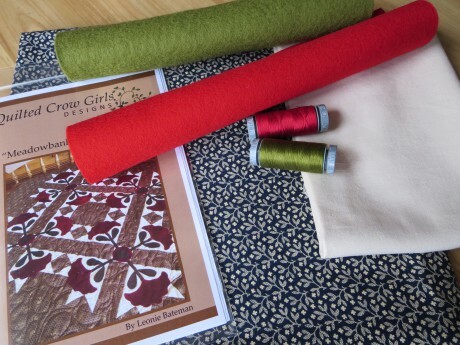 I’m off right now to gather my red, white and blue fabrics for an Independence Day or maybe a Bastille Day quilt …..